The members work very hard to raise funds for the the Bella Vista Garden Club Dorothy Wallace Scholarships. and the Annual Card Party in March. The scholarship program was named for Dorothy Wallace in 2002. Scholarships were awarded to Georginna Carrico (left) and Jordan Slater (right) at the September 2017 meeting. Georgina hopes to go into vineyards and wine making while Jordan is interested in native plants and sustainability. Both expressed their appreciation for the scholarships. and Tips from a Rosarian. Due to her love of teaching and the contributions she made to the Bella Vista Garden Club, the scholarship program was dedicated to her in 2002. The Bella Vista Garden Club Dorothy Wallace Scholarships are named in memory of the Bella Vista Garden Club Past President who loved teaching and made many contributions to Bella Vista and our Garden Club. After completing extensive training in horticulture and design in Iowa she become a certified Judge for the National Garden Clubs, Inc. in 1968 and a Master Judge in 1978. Dorothy moved to Bella Vista in 1988 from Iowa and immediately joined the Bella Vista Garden Club and served as President from 1993 to 1995. She was a founding member of the Floralia Arranger’s Guild Garden Club. As a rosarian and judge she shared her knowledge of design and gardening by teaching design classes, workshops and giving demonstrations. Her contributions to the Bella Vista Garden Club’s bi-annual Standard Flower Shows brought attention to floral designers in Northwest Arkansas. Her enthusiasm and encouragement of the members lives on and the club’s Standard Flower Shows have won many State, Regional and National Awards. After being a member of a federated garden club in Iowa and in Arkansas for over 40 years, Dorothy passed away on December 18, 2001 at the age of 76. Jay Donham (left with Virginia Halman), graduating senior at Gravette High School, was the recipient of a $1,500 Dorothy Wallace Scholarship Award. Jay will be attending the University of Arkansas Agriculture School starting in the 2015 Fall Semester. 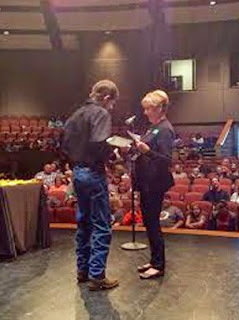 He was presented the Award by Incoming Scholarship Chairman, Virginia Halman at ceremonies on May 11, 2015. Drs. Meullenet and Karcher expressed their thanks for our interest in awarding scholarships as these scholarships are essential for many students to be able to continue their education. All three recipients expressed their thanks and told us about their senior year activities and plans after graduation. Bethany Sebesta is a resident of Benton County. She is a senior at the University of Arkansas, pursuing a degree in Horticulture, and after graduation in 2013 will pursue her Master’s degree. She is involved in the University’s GroGreen Club and a volunteer at “The Farm(a Cobblestone Project)”. Haleigh Smith is a resident of Benton County and will graduate from the University of Arkansas in 2013. Haleigh is currently Vice-President of the University’s Horticulture Club. This year she is spending in New Zealand with the WWOOFing program, which is a world-wide organization that promotes organic farming. scholarship at the September 2012 Meeting. The 2011 Dorothy Wallace Scholarship was awarded to Levi Parrish. Levi is a 21 year old Benton County resident who is attending NWACC pursuing an Associates of Applied Science degree in Landscape Design. Levi has a growing passion for landscaping driven partially by family who have encouraged his educational direction as well as his employer, Lowe's of Bella Vista. While attending college, Levi has been employed at Lowes for over 3 years on a part time basis in the Garden Center. He has also participated in their Building Together program, a community outreach program, that included Levi's work on raised beds for the Sunshine School. The Scholarship Committee was proud to introduce Levi to the membership at the January 26th meeting where members took the opportunity to introduce themselves and congratulate him on this special award! Pictured (left) are our two winning candidates in 2010 with BVGC embers and NWACC representatives. From left are: Marilyn Russell, Scholarship Committee; Amy Bensinger, NWACC; Charles May, scholarship recipient; Rebecca Webb, NWACC; Judi Shannon, Scholarship Committee; Janice Kennedy, Scholarship Committee Chairman; and Colt Smith, scholarship recipient. Both 2010 scholarship recipients were studying Civil Engineering. The field now has "green" applications in planning energy efficient land use, grading, rainwater drainage, power, landscaping, and building construction. On February 25th, the Club awarded its $1,000 Dorothy Wallace Scholarship to Colt Smith. These monies will cover a semester's expenses at NWACC where Smith is a working on an Associate's Degree in the Computer Aided Design Program for Landscape Design.